Uses: First aid care, health care, baby care. Special Features: The NitriSkin™ White Nitrile is a high-performing, latex-free exam glove for use in every application in a healthcare environment. Exceptionally soft, low modulus nitrile synthetic compound is very comfortable for extended periods. Very good donning properties. Slightly tacky exterior finish provides excellent gripping properties. 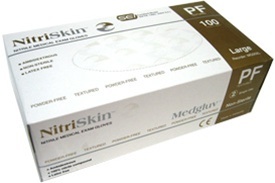 100% latex free to eliminate adverse reactions associated with natural rubber latex proteins. White color. 100/box, 10 boxes/case (1 case = 1,000 gloves). Gloves are ambidextrous (each glove fits either hand). Click Here for a Comparison of Glove Materials. Copyright © 2001- Direct Glove / Whole Supply.